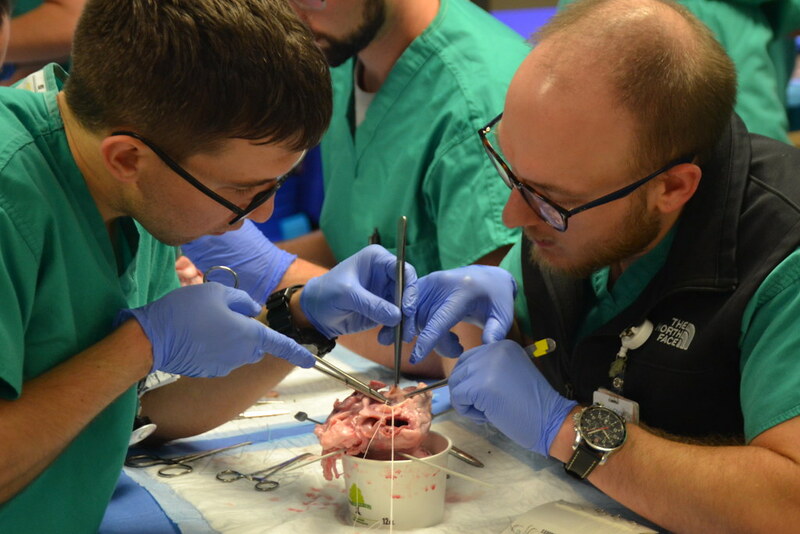 Brett Grizzell, M.D., cardiothoracic surgeon and KU School of Medicine-Wichita volunteer assistant professor, leads surgery residents through a skills lab using pig hearts. KU School of Medicine-Wichita's Department of Surgery recently offered a hands-on Surgery Skills Lab to first-, second- and third-year surgery residents, who had the unique opportunity of using pig hearts to practice placement of an aortic valve. Surgery residents who participated in the lab, which took place in September at Via Christi Hospital St. Francis, were guided by Jeff Patton from Edwards Lifesciences and Brett Grizzell, M.D., cardiothoracic surgeon who is a KU School of Medicine-Wichita volunteer assistant professor and also a KUSM-W alumnus. Dr. Grizzell and his OR team assisted residents in the steps and anatomy involved in the surgical procedure. The lab simulated a "continuum of care of a patient who presents with heart disease," Patton said. "I want to thank Dr. Grizzell and Jeff (Patton) for helping make this possible," said Marilee McBoyle, M.D., KUSM-W associate professor in Surgery. "The resident evaluations were over-the-top in acknowledgement of the tremendous amount learned and the appreciation for this learning experience." The skills lab started about 12 years ago as required by the Residency Review Committee of the American Board of Surgery. Faculty surgeons from KU School of Medicine-Wichita have led sessions in procedures that include laparoscpic suturing, vascular procedures, trauma, central lines and colonoscopy. Learn more about our General Surgery Residency program that is fully accredited and has been in continuous operation for more than 50 years. Scroll through the photo album below to see more photos from the lab.